I never expected this article to be one of the hardest to write, this the fourth rewrite and it has got no easier! The problem is I just don’t feel like I can do the Island of Harris justice, certainly not without sounding gushing and clichéd…it really was that good a trip! To what is truly one of the most beautiful locations Scotland has to offer, look I’ve started with the gushing already! So maybe I should apologize now for the clichés and moments of gushing that are inevitable in trying to describe Harris, the welcome and the fishing. Its almost 20 years since my last visit to these Islands of Scotland’s western frontier, I was but a chubby school boy with a tent, a good friend and a couple of fly rods. The trip had been great but we were beaten by glorious blue skies, sunshine and the worst sunburn I’ve ever had. The midges rose as the baking August sun set every night, so we turned tail and made for the ferry having only sipped from the over full glass of fine hill lochs and fishing that Harris has to offer, with literally hundreds of lochs most filled with hard fighting wild brown trout and many with sea-trout and the occasional salmon it a fly-fishers paradise. I had always said that I would return to Harris but had lacked any real commitment ’til last summer when I discovered a tweet by Gail Tunnah who runs Finsbay Fishing’s. 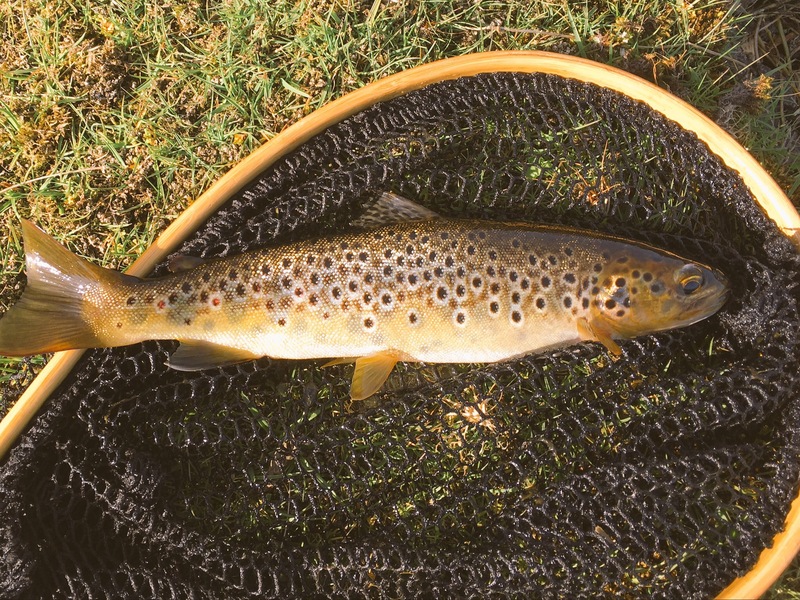 What sealed the deal was the January morning that the brochure for the fishing’s and their holiday cottages landed on the door mat, a cold January morning spent leafing through it dreaming of wild brownies, it had me hooked! 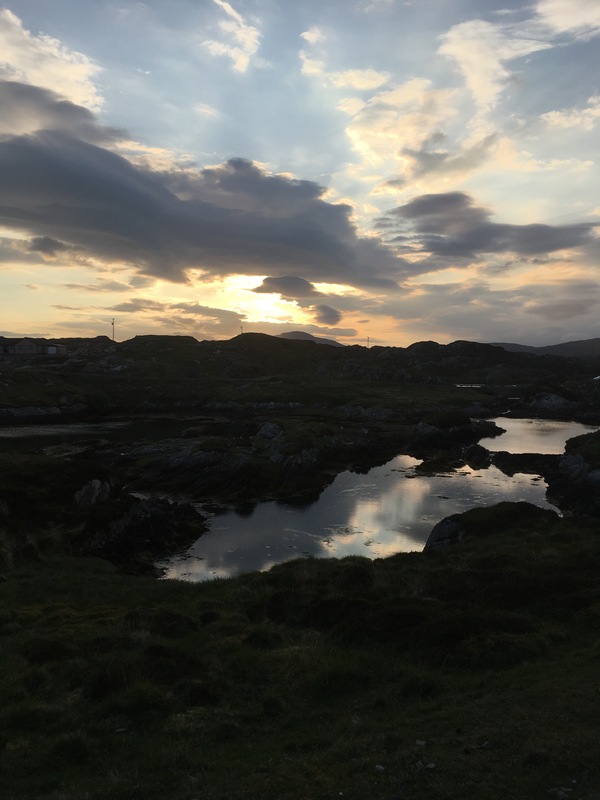 It was all just a matter of finding the time so when the opportunity arose and ten days became free in my diary at the start of June I began planning an adventure and immediately Harris came to mind. Spending a few day pouring over maps and noting how accessible the lochs and fishing’s were, I had the hair brained notion that this adventure would be on foot. I am happy to admit that having once been a keen mountaineer I have softened with age and wisdom and enjoy the comforts of a nice hotel and clean bed after a day or nights fishing. But I was feeling bold for this trip. Maybe it was a reniessounce, a reliving of younger days. Exploring on foot just seemed the best way to immerses myself in the plentiful and accessible fishing plus the public transport links on and to Harris really are very good, putting many on the mainland to shame. So I packed the rucksack with a lightweight one man tent, sleeping bag, stove and freeze dried meals, lightweight is ………well a figurative term because once you have packed every thing you need to survive for seven days without visiting a shop it weights alot more than you would imagine, nearly 14kg. The fly-fishing tackle the cherry on top. The 1st of June saw me heading westwards by bus from Aberdeenshire to Uig the ferry port in Northern Skye and the link to Tarbert on Harris. As we drew ever nearer Skye the clouds cleared and from horizon to horizon pale blue sky and warm early summer sunshine, little did I know then that this perfect beach weather was to follow me from the day I arrived on the island till the very hour I climbed on the ferry and sailed south for North Uist seven days later. The weather was almost identical to 20 years earlier, had I stumbled on a well-kept secret about Harris? That from May till September these Isles where bathed in Mediteraining sunshine? Alas apparently that’s not the case and by pure luck Mother Nature was playing a cruel joke on this hapless fisher. Harris is one of the chain of Islands that make up the Western Isles, and are the first real land fall for the worst that the Northern Atlantic weather systems can throw. Really I shouldn’t complain I should shut up and make the most of the stunning weather but as an A-typical fly-fisher much like the stereotypical farmer; one is never happy with the weather. I was heading for the Finsbay Fishings (http://finsbaycottages.co.uk) a group of over a 100 lochs divided into 3 areas, Stockinish; the northern group of lochs, Flodabay the middle group of lochs and Finsbay the southern group comprising of nearly 50 lochs. 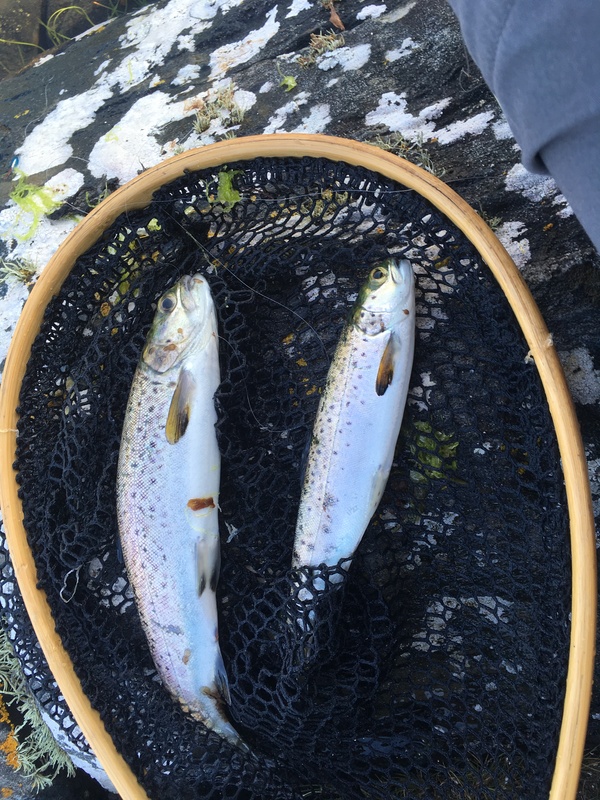 With boats on 20 of the 100 lochs and fantastic sea pools the fishing can be as diverse as you want from classic highland boat drifts to a day exploring hill loch on foot, some not much bigger than a bathtub but still containing wild brownies. 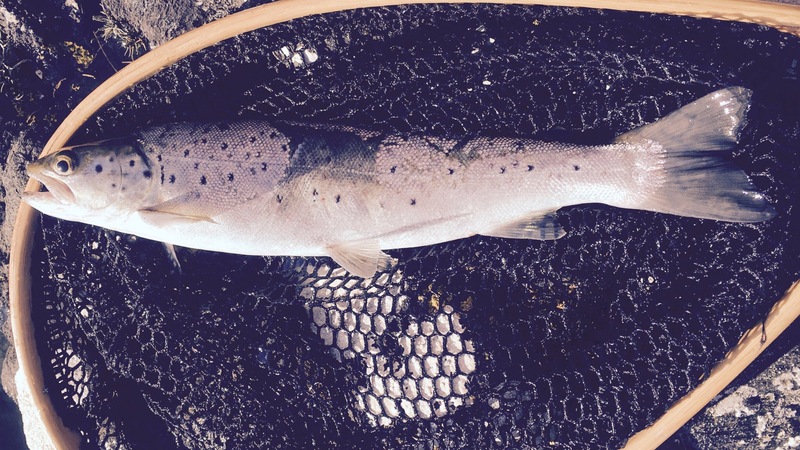 Some of the Finsbay fishings lochs have produced some real lunkers; brownies over 11lb and sea trout over 14lb. So you never know your first or your last cast may produce a beautifully marked hard fighting fish of a lifetime but aside from the monsters there are plenty of free rising hard fighting brownies that inhabit these lochs. Over every rise and in every hollow there seemed to be a loch, it’s a smorgus board of choice, you could spend a life time exploring these lochs and still not fish them all. I began my adventure on the stockanish lochs. Having got the permits at the crack of dawn, I had my tent pitched by lunch time and was off with rod in hand exploring loch Creebhat and loch Glumradh Mor, managing to produce a couple of fish from shady nooks but I was fast discovery what was to be my nemesis for the duration of the trip. 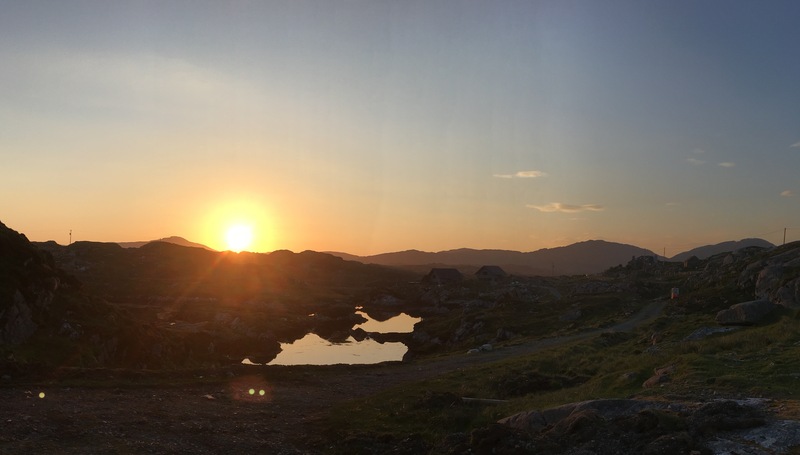 The bright warm sunshine putting paid to anything but morning and late evening fishing, which could be exploited by camping, able to move from loch to loch and only have a short distance to stumble from sleeping bag to bank or boat. Every night as the sun set an hour or two of a rise would ensued, producing a few fish to the traditional highland wets. Over dinner I sat watching the tide surge into the sea pools creping ever higher from one pool to the next and with it sea trout, topping and showing tantalizing splashes drawing you to the water like the sirens song. I set up a cast with just a single dropper about 6-7ft back from the point fly I opted for a classic sz12 teal and blue on point and a size 12 Claret Bumble on the dropper. As the tide peaked I began sending out casts landing the fly tight to the rocks across the pool, giving them to the count of 8 to sink and then a fairly fast retrieve. It produced instant results Bang! a 1.5lb sea trout takes me on a trip up and down the pool fighting me for every inch of line as I retrieve it to the net and then almost every second cast produces a take providing a very enjoyable hour of sport over the tide turning. The finnock and sea trout hitting the flies hard and fighting like monsters, the sort of sport that you can often only dream of, double hook ups, loosing as many as you land in a frantic hour of mesmerizing fun. Nothing over 1.5lbs but that didn’t matter as they felt like monsters on the 5wt 9.6ft rod, almost pulling it from your hand and as the sun began kissing the hills to the West the action tailed off and I returned to my tent buzzing. I had landed more sea trout in that frenetic hour than I had seen in the previous four seasons. I will admit I favour Brown Trout fishing over all other but Harris sea trout had hooked me and three of the next four days I spent on the hunt for Harris Sea Trout. The tides played ball with high tide arriving between 6 and 10 pm and allowing some great sport to while away my evenings producing; finnock, sea trout, slob trout and much to my surprise Pollock. A 1lb seat trout on the point fly and half pound Pollock on the dropper every cast a surprise. I hadn’t forgotten about the bars of gold I had come in search of, venturing out in the mornings exploring the nearby lochs of Holmasaig, Dempster and Humabhat all of which lie on the same system as the sea pools of my first nights fun. Saturday morning I wasn’t feeling too optimistic, the the warm morning sun seemed already high in the sky as I stumbled over heather and peat hag before 7am making my way round the east bank of Dempster but the sound of fish freely rising around the reeds and margins greets me, a real surprise! The lochs where showing the effects of nearly a months warm and very dry weather and I was worrieed that in these kind of conditions the fish had become stressed with lower water levels and reduced oxygen levels, switching off from feeding and had disappeared into deeper waters. However it appears Harris trout are made of sterner stuff ; oblivious to the bright sunshine even with the clear lightly peated water giving little protection, they were feeding on the surface! A dry fly fishers dream I opt for a light cast of about 2.4lbs and a single fly to reduce any drag. I throw on a fly I tie at size 16; Quill and elk hair midge on a light Grub hook which sits right in and through the surface film, mimicking the large midge that were occasionally hatching and the main attention of the rising trout. Making a long cast I let the wind drift the fly over the rising fish, a breathless wait willing a take soon rewarded with a strong splashy hit, striking as much out of instinct as a reaction in fright at the sudden splashy. A quick reaction imperative as these wild beauties discard the fly as quickly as they strike. An hour and a half of brilliant surface action, having to replace the fly several time as the vicious takes soon took their toll on the small flies, these the tattered reminants in the fly patch serve a a reminder of some fantastic sport. I would have loved to fish from dawn till dusk but the glorius weather put paid to that, but when it did allow the sport was spectactular, exciting and varied. I honestly cannot express how much I enjoy my time on the island and the rugged beauty of Harris, a landscape that can make you feel like the only person alive. The people are warm, friendly and welcoming. And of course the great fishing, Harris has it in bucket fulls! You could write and article about everyday and every loch each would be quite a different story. I wanted to give you a taste, but the only way to truely experince it is to go! I was genuinely sad the morning I packed up and headed for Leverburgh and on to North Uist, Harris has a lot more fishing to offer and I guarantee it will not be another 20 years till I next wet a fly on Harris. I can’t thank Gail Tunnah who runs Finsbay, and Alistair Mackinnon the Ghillie enough for the friendly welcome and all the help, I hope to see you all again soon.